Social Justice is very important to the staff and students of Sacred Heart School. Our iLEAD Option Class, in partnership with Denham Ford, supported our local food bank with the We Scare Hunger Food Drive. The junior high art class created the Monopoly Man for the WDACS Pumpkin Ball. We have participated in this social justice project for six years now and our creations have collectively raised between $10,000.00 and $12,000.00 for WDACS. We are delighted to announce that our Annual Terry Fox Run was a huge success. We surpassed our goal of raising at least one toonie per student! To date, we have raised approximately $1200.00, with more coming in every day! Congratulations on making our Coins for Cancer campaign a huge success! THIS IS WHO WE ARE, EVEN WHEN NO ONE IS WATCHING!!! Thank you to all of the students and teachers who contributed with money, a kind gesture and especially the footprints (see the picture attached). A special thank you to Mrs. Vogel, Mr. Rosetto and Mrs. Shakeshaft for their touching stories and to Mr. Hamer for his Power Point and for coming to set up the gym the night before! At this time, we would like to thank all of our volunteers who made this event possible: Jill Toldy, Katrina Staple and Sandi Hancock for the entire set up, manning the water station, first aid station and counting coins. Special thanks to the Grade 4 Weatherill students and Junior High Worship Team for their wonderful music! Thank you also to all teachers who helped out! Please accept our sincere apologies if we have been remise and missed anyone. Finally, as the students have surpassed their goal of a toonie per student, the entire school will be treated with a performance and an ice cream party sponsored by our Admin Team! More information will be forthcoming as to when this will take place. Sacred Heart Working Together to Outrun Cancer! Our Grade 4 class is currently collecting pop can tabs to donate for insulin pumps and wheel chairs. Please bring in tab donations to school. There is a big container to place them in, in the PIT. On Tuesday, April 10th, our school ordered Dominos Pizza for Hot Lunch with 100% of the cost and profits being donated to the Go Fund Me Page for the Humboldt Broncos. We raised $650. On Thursday, April 12th, we joined the rest of the country in solidarity on Jersey Day. 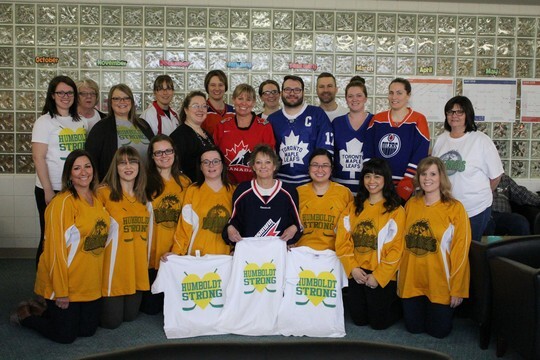 Students in the school wore Jerseys on this day as well, Don at Coach's Source for Sports donated Jerseys and T-Shirts with the Humboldt Broncos Logo silk screened on them. Teachers made donations to purchase them. All proceeds went to the Go Fund Me Page for the Humboldt Broncos. This raised about $600. On Friday, April 13th, our Student Leadership Team made green ribbons to be sold for $1.00. All the supplies to make the ribbons were donated by a teacher, which means that all profits will be donated to the Humboldt Broncos Go Fund Me Page. Our Junior High Creative Arts Class made the Green Goblin for the Pumpkin Ball. Our iMAD Class raised money by selling pink cupcakes on Pink Shirt Day. The money raised was used to purchase a BBQ for the Good Shepard Seniors Home. Our school is collecting donations during Track & Field this year. The money is going to support the Gord Bamford Foundation. The Gr. 2's collected and donated mittens and toques to NOW. Our Jr. High students participated in WE Day. The Junior High Food Class is continuously cooking pancakes each term for emergency lunches for those students who come to school and do not have a lunch. The entire school population collects food for the local food bank. Grade 7P brought in cash donation to purchase toys for the Sacred Heart Angel Tree. Each Christmas our school adopts one or two families and we purchase gifts for each member of the family to help make their Christmas a little bit brighter. Our Junior High iLEAD Option Class donated $500 to the Camrose Women's Shelter. The money was raised through Tuesday Pizza Sales. Our Share Lent Campaign Project this year raised $598.